Nurses help to save lives. They work to cure illness with compassion and care. Therefore, it should come as no surprise that these understated warriors are proud of their jobs, and their ink can show it. With 42 percent of people in the U.S. having a tattoo, it makes sense that you are starting to see tattoos becoming more common in the healthcare field. 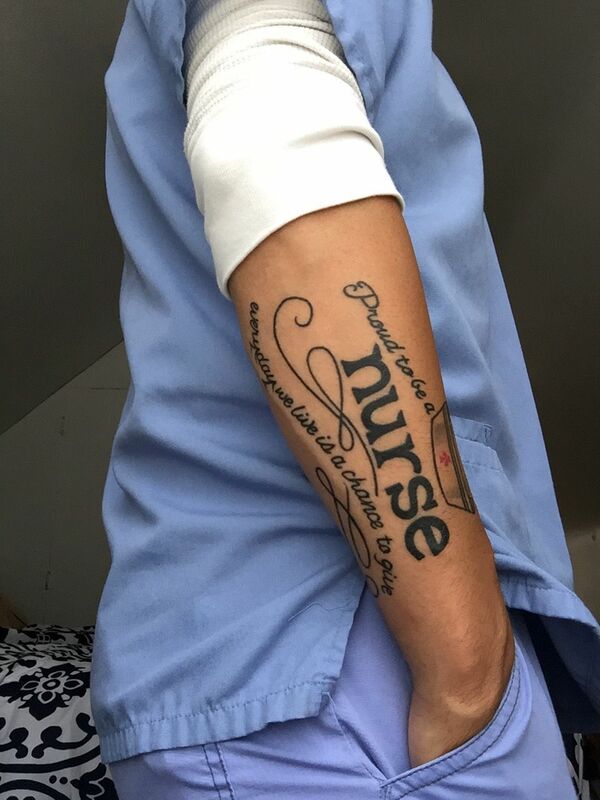 However, the types of tattoos that you will see on nurses are distinctly unique to this profession. The art dusting the body might be full color, black and gray, or a pleasant mix of the two. While these medical art forms can take on some remarkable features, there are a few elements that are found throughout like the Caduceus, nurse's cap, stethoscope, and heart rhythm, just to name a few. Nurse tats are as diverse as the field of professionals and range from small single pieces to full sleeves of art. You can find tattoos that are suitable for both men and women. A very common design among medical tattoos is the Caduceus. This symbol finds its roots in ancient Greek mythology as the symbol of Hermes or Mercury. The snakes within the design offer a powerful symbol of healing and immortality. Regardless of its history, the Caduceus is deeply ingrained in medicine. Add an RN, and you have a unique symbol defining your professional life as a modern-day healer. Placement of this simplistic design can go pretty much anywhere but might fit well on the calf, shoulder, bicep, or forearm. When you think of a nurse coming in to check on you, what is one of the first things you think of? The stethoscope, of course. These angels in disguise always use this to check your blood pressure, and at times, your heart. This common symbol works well in most tat designs. Not only can it take center stage, but it can be used along with other elements like a nurse's cap or angel wings. The wings have a significance all their own as well. This element can show the giving and caring of the nurse, or they might be used to represent the patients that the nurse has lost in their career. The wings allow the nurse to show how each patient made an impact on his or her heart. 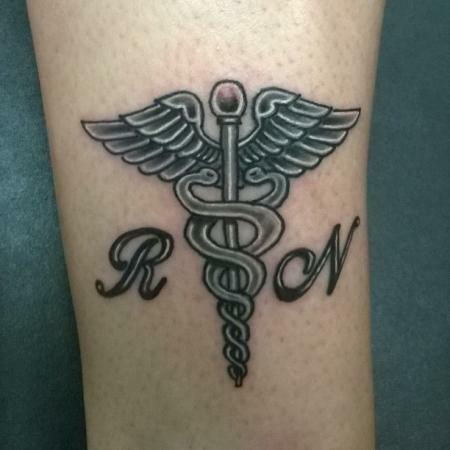 Again, the simple RN initials make this a distinct piece for any registered nurse. While you can choose to place this diverse piece anywhere, given the design and meaning, placing it over the heart or along the collarbone could add significance. If you are looking for something a bit more masculine, black and gray words never go out of style. The word nurse with the phrase 'everyday we live is a chance to give' is a very common tat for an RN. This can be a very feminine tattoo with the addition of the nurse's cap or you can give it a masculine feel with some bold and blocky words. Other elements can be added to the wording like the stethoscope or even a heart. Given the length of this piece, down the calf or along the forearm work best. You could also place this across the chest. 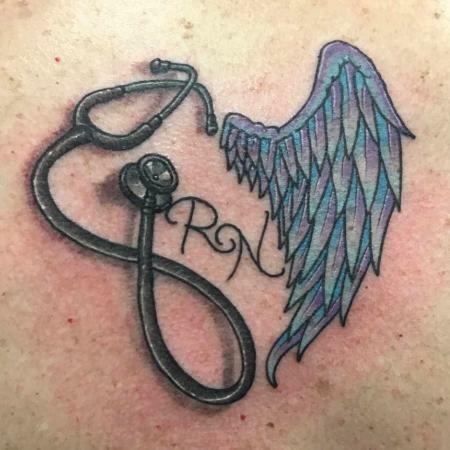 If you want to take the creativity of your RN tattoo to the next level, you can add some really creative elements like watercolor. 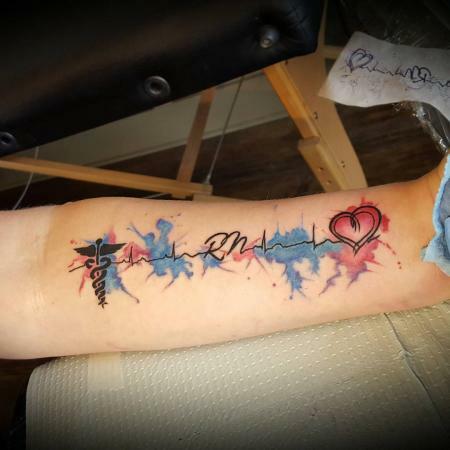 Along with the Caduceus, heart and words, you can add watercolor elements that very effectively signify the most vital part of the human body: blood. The splash of the reds and blues signify the life gold flowing in your veins but in a very whimsical way. The way the heart rhythm flows into the RN initials also connects the field to your love of healing. 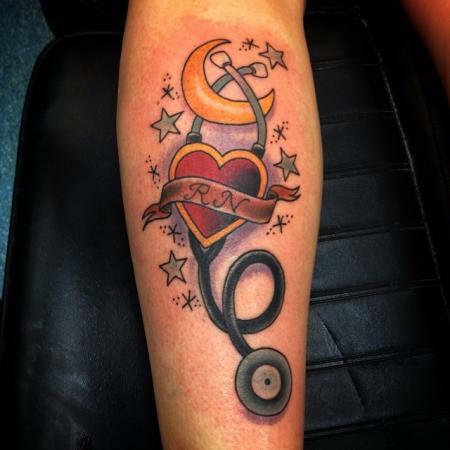 A common tattoo that can take the form of registered nurse designs is the heart tattoo. This can either be traditional heart shape, or can take on a unique twist by adding realism. The elements that really solidify this as a nurses piece include the stethoscope and the nurse's cap. However, this would work just as well with the RN insignia. Given the lifelike realism and size needed for this piece, the shoulder, back, upper thigh and bicep are great places to begin your own heart of realism. Regardless of your gender, this RN artwork adds a creative twist to your repertoire. There are a number of stereotypes associated with tattoos, and the idea of a medical professional with a tattoo can be difficult for some. However, the workforce is changing and becoming more flexible, especially in the medical field which needs highly qualified individuals. According to statistics, 76 percent of employers say they hire people with tats. Additionally, the American Institute of Medical Sciences & Education notes that the regulations for tattoos in the medical field vary greatly from institution to institution, but goes on to note that non-visible tattoos like those on the biceps, back, legs and other areas that would be covered by your scrubs are always acceptable. Sometimes tattoos are difficult to hide, and this can be a problem for some employers with strict dress codes. While some tattoos, like large full sleeve designs or facial tattoos, might be a problem, most small tattoos are okay even if they are visible. For example, a small tattoo on the inside of the wrist or on the back of the neck might be overlooked. However, tattoos displayed proudly on the knuckles might not get you the job. Therefore, it is important to think about the placement of your tattoo in visible areas and consider whether it could impact your career goals. 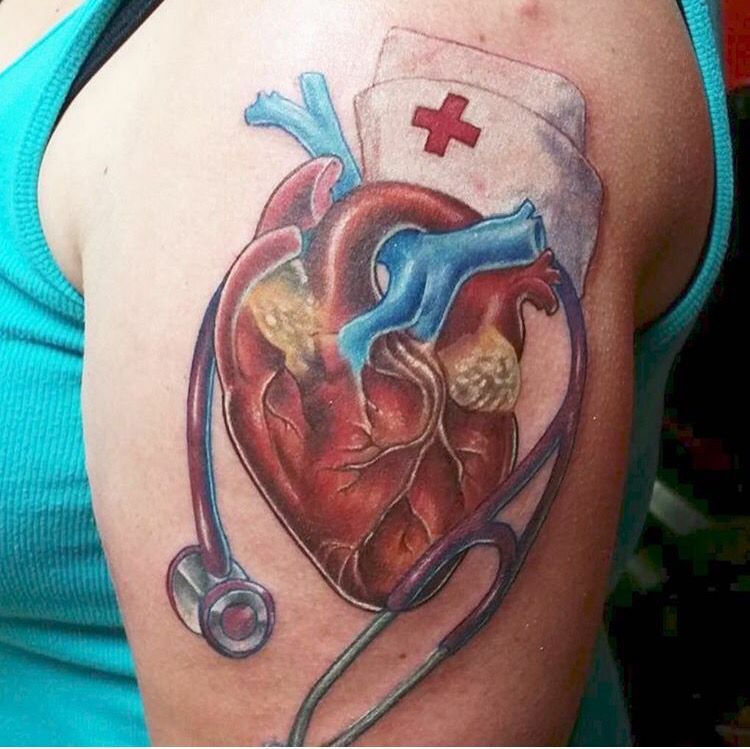 Nurses are vital in hospitals and their love of the career can show through their ink. 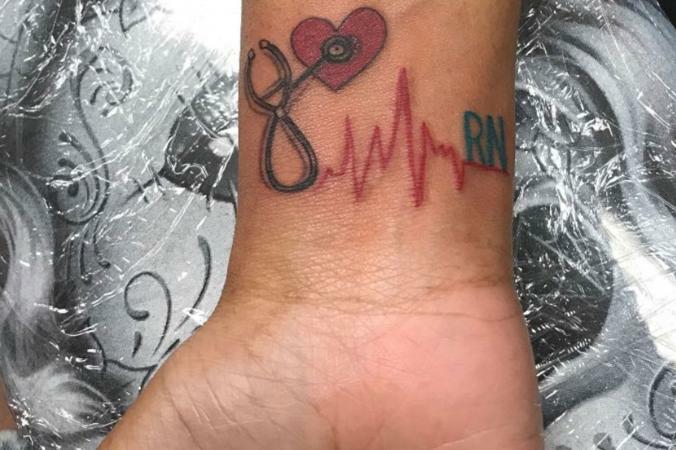 There are several designs that a nurse can choose but some common elements are the word nurse and RN, as well as a stethoscope, heart, Caduceus, and nurse's cap. While these designs can range from small to large and fit pretty much anywhere, you'll want to watch placing your work on a highly visible area since this could affect your professional growth. Find the best tattoo that represents you in the medical field and get tattooing.